The first thing that struck me was how nice it was to have such a mix of kids and tech side by side. The room was bursting with energy. And it wasn’t just boys, there were girls and plenty of them. At one point it seemed unreal as I was chatting with a fellow mum, discussing the pros and cons of the Eclipse IDE , with a quadcopter hovering nearby and a little girl doing snow-angels on the carpet. For me a that was a breath of fresh air from the normal male-dominated crowd at the conferences I normally frequent (added bonus: for once I was taller than half the people there). The first thing that caught our eye was the drone quadcopter being controlled by bananas (yes, bananas) via a MaKey-Makey kit. It was all I could do to wait patiently while my son had a go before I got to try. Joshua the drone owner was full of enthusiasm, super-friendly (my son ever shared his secret-name with him) and I thought remarkably patient. He even drew blood on the day retrieving the drone after one of our flights left it buzzing at the ceiling – now that’s commitment. Everything my son and I tried from minecraft to learning-robots to driving cars was explained to us by someone who was really excited to be there doing it. I thought the drone would win out as the favourite but it was just edged out by a fun session using a robot arm to move a ball between cups. I’ll admit to being mildly concerned about when lunch would be served in order to get the balance of snacking right (and that’s just for me). But there were plenty of snacks on hand, lots to distract ourselves with and when lunch was served it was worth waiting for. It was somewhat tricky to manage the make-your-own sandwich and the salads with giant tongs, but that said, I’ll take delicious & healthy food (in particular the yummy, succulent chicken) over food with good serving UX any day. In the middle of the afternoon @monkchips got the kids really thinking as they got philosophical about good robots and bad robots and even introduced Asimov’s laws of robotics. My tv-deprived son wasn’t familiar with most of the pop-culture references but I was amazed to see how keen he was to participate and have something to say. (It even got me thinking and my own conclusion is that there are no good robots or bad robots just robots that do good things or bad things). 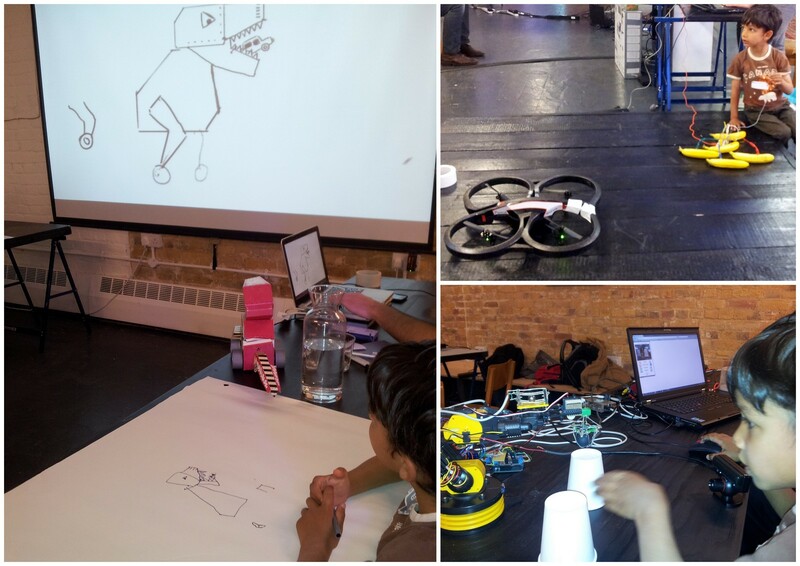 One of the best sessions was where my son got to draw robots alongside a very talented and creative artist. First he copied along the sketch of the car-eating dinosaur robot and then proceeded to make it his own adding in dinosaur skeletons and inevitably train-tracks. We protected it from the rain and brought it home so he could keep working on it.I too was really buzzing after day and pleased to be going home with instructions and more to create my very own robot arm. I might even make two. I can always do with an extra hand. A great day, and a big thank you to all who put it together.